“Luther at Erfurt”, which depicts Martin Luther discovering the doctrine of sola fide. Painting by Joseph Noel Paton, 1861. Martin Luther, O.S.A. ; (10 November 1483 – 18 February 1546) was a German professor of theology, composer, priest, monk, and a seminal figure in the Protestant Reformation. Luther came to reject several teachings and practices of the Roman Catholic Church. He strongly disputed the Catholic view on indulgences. Luther proposed an academic discussion of the practice and efficacy of indulgences in his Ninety-five Theses of 1517. His refusal to renounce all of his writings at the demand of Pope Leo X in 1520 and the Holy Roman Emperor Charles V at the Diet of Worms in 1521 resulted in his excommunication by the Pope and condemnation as an outlaw by the Emperor. Luther taught that salvation and, consequently, eternal life are not earned by good deeds but are received only as the free gift of God’s grace through the believer’s faith in Jesus Christ as redeemer from sin. His theology challenged the authority and office of the Pope by teaching that the Bible is the only source of divinely revealed knowledge from God and opposed sacerdotalism by considering all baptized Christians to be a holy priesthood. Those who identify with these, and all of Luther’s wider teachings, are called Lutherans, though Luther insisted on Christian or Evangelical (German: evangelisch) as the only acceptable names for individuals who professed Christ. In two of his later works, Luther expressed antagonistic views towards Jews, writing that Jewish homes and synagogues should be destroyed, their money confiscated, and liberty curtailed. Condemned by virtually every Lutheran denomination, these statements and their influence on antisemitism have contributed to his controversial status. Philosophy proved to be unsatisfying, offering assurance about the use of reason but none about loving God, which to Luther was more important. Reason could not lead men to God, he felt, and he thereafter developed a love-hate relationship with Aristotle over the latter’s emphasis on reason. For Luther, reason could be used to question men and institutions, but not God. Human beings could learn about God only through divine revelation, he believed, and Scripture therefore became increasingly important to him. He taught that true repentance does not involve self-inflicted penances and punishments but rather a change of heart. According to one account, Luther nailed his Ninety-five Theses to the door of All Saints’ Church in Wittenberg on 31 October 1517. 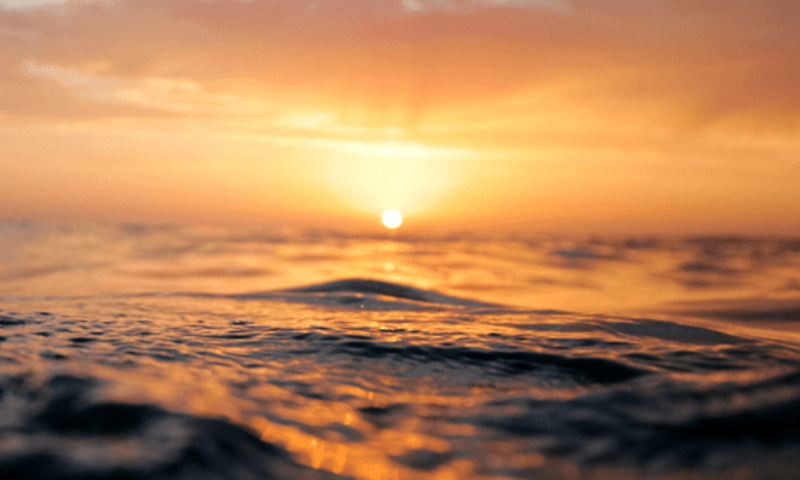 The first and chief article is this: Jesus Christ, our God and Lord, died for our sins and was raised again for our justification (Romans 3:24–25). He alone is the Lamb of God who takes away the sins of the world (John 1:29), and God has laid on Him the iniquity of us all (Isaiah 53:6). All have sinned and are justified freely, without their own works and merits, by His grace, through the redemption that is in Christ Jesus, in His blood (Romans 3:23–25). This is necessary to believe. This cannot be otherwise acquired or grasped by any work, law or merit. Therefore, it is clear and certain that this faith alone justifies us … Nothing of this article can be yielded or surrendered, even though heaven and earth and everything else falls (Mark 13:31). Luther’s rediscovery of “Christ and His salvation” was the first of two points that became the foundation for the Reformation. His railing against the sale of indulgences was based on it. On 15 June 1520, the Pope warned Luther with the papal bull (edict) Exsurge Domine that he risked excommunication unless he recanted 41 sentences drawn from his writings, including the Ninety-five Theses, within 60 days. (…) Luther was excommunicated by Pope Leo X on 3 January 1521, in the bull Decet Romanum Pontificem. The Emperor presented the final draft of the Edict of Worms on 25 May 1521, declaring Luther an outlaw, banning his literature, and requiring his arrest. In 1521 Luther dealt largely with prophecy, in which he broadened the foundations of the Reformation, placing them on prophetic faith. His main interest was centered on the prophecy of the Little Horn in Daniel 8:9–12, 23–25. The antichrist of 2 Thessalonians 2 was identified as the power of the Papacy. So too was the Little Horn of Daniel 7, coming up among the divisions of Rome, explicitly applied. Do you know what the Devil thinks when he sees men use violence to propagate the gospel? He sits with folded arms behind the fire of hell, and says with malignant looks and frightful grin: “Ah, how wise these madmen are to play my game! Let them go on; I shall reap the benefit. I delight in it.” But when he sees the Word running and contending alone on the battle-field, then he shudders and shakes for fear. 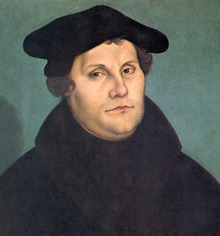 Luther’s pamphlets against the Church and the hierarchy, often worded with “liberal” phraseology, now led many peasants to believe he would support an attack on the upper classes in general. 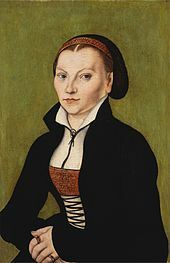 Katharina von Bora, Luther’s wife, by Lucas Cranach the Elder, 1526. Some priests and former members of religious orders had already married, including Andreas Karlstadt and Justus Jonas, but Luther’s wedding set the seal of approval on clerical marriage. Luther’s thought is revolutionary to the extent that it is a theology of the cross, the negation of every affirmation: as long as the cross is at the center, the system building tendency of reason is held in check, and system building does not degenerate into System. For Luther’s biographer Martin Brecht, this partnership “was the beginning of a questionable and originally unintended development towards a church government under the temporal sovereign”. Luther based his order on the Catholic service but omitted “everything that smacks of sacrifice”, and the Mass became a celebration where everyone received the wine as well as the bread. He retained the elevation of the host and chalice, while trappings such as the Mass vestments, altar, and candles were made optional, allowing freedom of ceremony. Luther’s Small Catechism proved especially effective in helping parents teach their children; likewise the Larger Catechism was effective for pastors. Using the German vernacular, they expressed the Apostles’ Creed in simpler, more personal, Trinitarian language. He rewrote each article of the Creed to express the character of the Father, the Son, or the Holy Spirit. Luther’s goal was to enable the catechumens to see themselves as a personal object of the work of the three persons of the Trinity, each of which works in the catechumen’s life. That is, Luther depicted the Trinity not as a doctrine to be learned, but as persons to be known. The Father creates, the Son redeems, and the Spirit sanctifies, a divine unity with separate personalities. Salvation originates with the Father and draws the believer to the Father. Luther’s treatment of the Apostles’ Creed must be understood in the context of the Decalogue (the Ten Commandments) and the Lord’s Prayer, which are also part of the Lutheran catechetical teaching. “Faith alone justifies us, and not works”. The Luther Bible influenced other vernacular translations, such as William Tyndale’s English Bible (1525 forward), a precursor of the King James Bible. Luther connected high art and folk music, also all classes, clergy and laity, men, women and children. His tool of choice for this connection was the singing of German hymns in connection with worship, school, home, and the public arena. 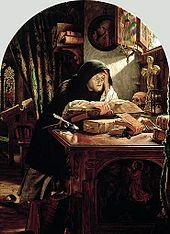 Some scholars have asserted that Luther taught that faith and reason were antithetical in the sense that questions of faith could not be illuminated by reason. He wrote, “All the articles of our Christian faith, which God has revealed to us in His Word, are in presence of reason sheerly impossible, absurd, and false.” and “[That] Reason in no way contributes to faith. […] For reason is the greatest enemy that faith has; it never comes to the aid of spiritual things.” However, though seemingly contradictorily, he also wrote in the latter work that human reason “strives not against faith, when enlightened, but rather furthers and advances it”, bringing claims he was a fideist into dispute. Contemporary Lutheran scholarship, however, has found a different reality in Luther. Luther rather seeks to separate faith and reason in order to honor the separate spheres of knowledge that each applies to. Luther had argued against resisting the Turks in his 1518 Explanation of the Ninety-five Theses, provoking accusations of defeatism. He saw the Turks as a scourge sent by God to punish Christians, as agents of the Biblical apocalypse that would destroy the antichrist, whom Luther believed to be the papacy, and the Roman Church. In 1542, Luther read a Latin translation of the Qur’an. He went on to produce several critical pamphlets on Islam, which he called “Mohammedanism” or “the Turk”. Though Luther saw the Muslim faith as a tool of the devil, he was indifferent to its practice: “Let the Turk believe and live as he will, just as one lets the papacy and other false Christians live.” He opposed banning the publication of the Qur’an, wanting it exposed to scrutiny. Claiming that the law – in any form – should not be preached to Christians anymore would be tantamount to asserting that Christians are no longer sinners in themselves and that the church consists only of essentially holy people. On the other hand, Luther also points out that the Ten Commandments – when considered not as God’s condemning judgment but as an expression of his eternal will, that is, of the natural law – also positively teach how the Christian ought to live. This has traditionally been called the “third use of the law.” For Luther, also Christ’s life, when understood as an example, is nothing more than an illustration of the Ten Commandments, which a Christian should follow in his or her vocations on a daily basis. From December 1539, Luther became implicated in the bigamy of Philip I, Landgrave of Hesse, who wanted to marry one of his wife’s ladies-in-waiting. The affair caused lasting damage to Luther’s reputation. Though Luther rarely encountered Jews during his life, his attitudes reflected a theological and cultural tradition which saw Jews as a rejected people guilty of the murder of Christ, and he lived in a locality which had expelled Jews some ninety years earlier. He considered the Jews blasphemers and liars because they rejected the divinity of Jesus. In 1523, Luther advised kindness toward the Jews in That Jesus Christ was Born a Jew and also aimed to convert them to Christianity. When his efforts at conversion failed, he grew increasingly bitter toward them. Luther was the most widely read author of his generation, and within Germany he acquired the status of a prophet. According to the prevailing opinion among historians, his anti-Jewish rhetoric contributed significantly to the development of antisemitism in Germany, and in the 1930s and 1940s provided an “ideal underpinning” for the Nazis’ attacks on Jews. Luther made effective use of Johannes Gutenberg’s printing press to spread his views. He switched from Latin to German in his writing to appeal to a broader audience. Between 1500 and 1530, Luther’s works represented one fifth of all materials printed in Germany. In the 1530s and 1540s, printed images of Luther that emphasized his monumental size were crucial to the spread of Protestantism. Martin Luther is honored in various ways by Christian traditions coming out directly from the Protestant Reformation, i.e. Lutheranism, the Reformed tradition, and Anglicanism. where she is nourished for a time, and times, and half a time, from the face of the serpent. cast out of his mouth.